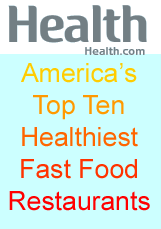 Health.com released its list of America's top ten healthiest fast food restaurants. There are a few rankings I agree with and a few that make me cringe. For instance, Chipotle broke the top ten list. As I posted, there are definitely ways to make Chipotle dining incredibly healthy. Click ahead to get the top ten and my suggestions for who they should yank. 10. Taco Del Mar: Never heard of them. That being said, I researched, and they look a lot like Moe's Southwest, Wahoo's Fish Taco's or Baja Fresh. As I always say, Mexican food if done without the dangerous three C'S (cheese, chips and sour Cream) can be quite healthy. 9. Einstein Bros. Bagels: YUM! I used to be quite addicted to their low card/high protein bagel back at the Georgetown location in Wash DC. They have excellent coffee and hummus as well. I am a big fan of Einsteins. 8. McDonald's: WHAT?! Is this a joke to see if I am paying attention? Did you see Super Size Me???? The review from Health.com says: "We love: The chain’s 260- to 270-calorie Snack Wraps (choose grilled chicken) for protein without a lot of unwanted carbs. Danger zone: Although McDonald’s made our list, this is still the land of supersizing and giant sodas. It’s up to you to request a small." The also say the apple dippers are great for kids. Have you tasted those dippers? The apples are not crisp and seem to have oxidized and antioxidants or flavor that were in the fruit to begin with! ...I really doubt anyone goes to Micky D's and simply orders a Snack Wrap and bottled water to go. 7. Atlanta Bread: Never heard of it. But seems to be similar to Panera. 6. Chipotle: Yay Chipotle. If you make healthy choices, Chipotle can be quite healthy. The Health.com review says: "We love: Burrito Bowls, which let you skip the tortilla—and the extra carbs. Danger zone: The dark side of a buffet is that you can go wild. So you have to go light on cheese and sour cream." ...I totally agree. Check out my eating healthy at Chipotle tips post. 5. Corner Bakery Cafe: Never been. But the website looks pretty good. I don't know if this is fast food though. 4. Noodles and Company: An Asian-food option on the list, yay! Asian food like low fat spicy veggie soups, tofu, rice and low-fat noodles can be incredibly healthy. Just watch out for the sodium in the soy sauce! An oh yes have a big helping of wasabi for me. 3. Au Bon Pan: I used to love Au Bon Pan, and then I found Le Pain Quotidien and Au Bon just didn't compare. But Au Bon is certainly a healthier option than say McDonald's. Avocado veggie and mustard sandwich was one of my favorites whenever I was forced to eat at a "mall" food court. 2. Jason's Deli: Never heard of them. But portion control and organic ingredients make this place sound A-OK. Health.com says: "We love: Being able to build any sandwich on an organic whole-wheat wrap." 1. Panera: OK, I do love Panera. Healthy whole grain bread options. Vegan soups and sandwiches. Vegan salads. Yummy whole wheat crusty bread. Panera is on my good list. And may not be MY number one, but definitely in my top ten. SUBWAY: Uh, for one, Subway. Now I don't recommend eating at Subway everyday, and they certainly have their dark side. But Subway is so widely known, and so widely known for its healthy options, it seems silly to leave it off the list! Healthy choice at subway: Veggie Delight (vegan) or Veggie Patty (not vegan, contains egg), honey oat bread, no cheese, all the veggies, spicy mustard and light oil/vinegar, salt/pepper, oregano. Yum. COSI: Cosi has a lot of healthy options. It even adds nice gourmet touches like fresh basil on their flat bread sandwiches. And whole grain flat bread is an option now. Just stay away from those Oreo frozen shake things. LE PAIN: Le Pain Quotidien is my favorite chain. OK, it is mostly sit-down, but you can easily get a meal to go and be out in a flash. Their menu is organic and they indicate which items are vegan. Vegan salads, sandwiches and muffins are all amazing and healthy. MOE'S SOUTHWEST: Not widely known, but Moe's is a more vegan-friendly version of Chipotle. Why? Well they have tofu as an option for a filling. And everything is done prepared in a healthy way. LAST WORD: McDonald's should not be on that list. It is so irresponsible for Health.com to add them. Just because they add some soggy apple slices to their kids menu doesn't mean they have gone healthy. I'd like to see some research into how many Happy Meals get those apples instead of the fries anyways. McDonald's is not one of America's healthiest fast food joints. Ugh. So ridiculous. OK, What did I miss???? I know you all have your own favorites that they forgot. Let me know in the comments section!